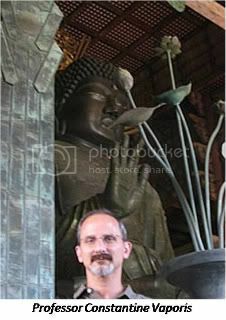 On behalf of the Samurai Archives, I’m pleased to be interviewing author and historian Professor Constantine Vaporis. 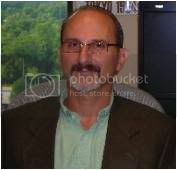 Professor Vaporis, who received a PhD from Princeton, currently teaches Japanese and East Asian History at the University of Maryland, Baltimore County (UMBC). A noted scholar, Professor Vaporis has been the recipient of research grants in the field of Japanese history from the National Endowment for the Humanities (NEH), the Fulbright Program and the Japan Foundation. 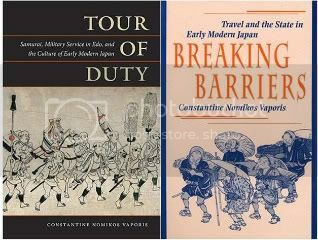 Professor Vaporis has authored two books on Edo period Japan—Breaking Barriers: Travel and the State in Early Modern Japan and Tour of Duty: Samurai, Military Service in Edo and the Culture of Early Modern Japan. Professor Vaporis is known to check out the action on the Samurai Archives Citadel of Japanese History from time to time and is also a valued member. SA: Professor Vaporis, it’s a pleasure to have you here with us for this interview. CV: Thank you. The pleasure is mine. As you noted, I have enjoyed being a member. I’ve benefitted personally from the Archives and so have many of my students. SA: If you don’t mind, let’s start off with some basics. How did you become interested in Japanese history? What was the allure? CV: I first fell I in love with Japan back in middle school when my father and I, along with my older brother, used to go to Japanese film festivals in Boston. I saw most of the classics of the 1960s this way. And, when an offer to learn Japanese came from one of my father’s students, who had been stationed in the military Japan in the mid-1950s, I jumped at it. So, to answer your question more directly, I first became enthralled with Japan and Japanese history as it appeared in celluloid and followed up that interest by studying the language. “Harakiri,” “Kiru,” “Ikiru,” and of course “Miyamoto Musashi” were some of my favorites—and now I teach a film course that uses a number of these. SA: Your publications focus on the Edo period. What is it about the Edo period that fascinates you the most? Are there any other periods of Japanese history in which you have a special interest? Why? CV: Let me answer these two together, as they are closely connected. When I headed to Princeton in 1980 to begin my graduate work, I intended to specialize in the late Warring States period and thought I might write a dissertation on one of the sengoku daimyo, like Takeda Shingen or even Oda Nobunaga. But, in Marius Jansen’s famous Friday morning seminar in Japanese history I read Englebert Kaempfer’s History of Japan and I was hooked on the Edo period. The vitality of the period, and as I later discovered, the richness of the historical record which remains for it, drew me in. Here I am, almost thirty years later still excited by teaching and researching the Edo period. However, the last quarter of the 16th century in Japan still fascinates me. It was a dramatic, colorful period in Japanese history with personalities that were larger than life. It was also a time when European and Japanese history intersected—collided, really—, which added to the color and drama. By reading the letters the Jesuits sent home, particularly those of Alessandro Valignano, this all becomes clear. CV: Nobunaga would be one, again, because he was larger than life; his life was cut short, which makes one think about how the course of Japanese history might have been different had he lived long enough the complete his mission of unifying the realm. Though not a Japanese, the life of Ganjin (Jianzhen) is fascinating to me. As you can see, I am drawn to travelers! Risking his life six times to make the sea-crossing to Japan in order to spread the dharma there, he finally made it in 753, by which time he had lost his sight. One can’t help but be awed by him and other travelers, both Japanese and Chinese, who braved the seas to travel to the other country on cultural and religious missions. CV: Plenty of not-so-famous people fascinate me, too—like many of the diarists I encountered in researching Tour of Duty. Mori Masana of Tosa would be the best example. He strikes me as a bit of a maverick, something that was only possible for a younger son in a bushi family. He loved the physical as well as the intellectual and cultural. He was a prolific diarist, and his accounts are entertaining to read—not something one can say about most bushi diaries. He allows his personality to peer through his words. For example, wrestling sumo on the beach while the Tosa lord’s entourage waited for more favorable winds before setting sail, he injures his leg, but jokes in his journal about walking all the way to Edo on three legs. He spent much of his time in Edo studying as part of a number of cultural salons; he loved to shop and collected a large quantity of calligraphy and sword guards. On his first of many trips to Edo he did not have any official duties, but did something to attract the attention of officials close to the lord, and he was later rewarded for meritorious duty in protecting the lord as he was shuffled from place to place as a major fire spread across the city. He strikes me as a charismatic, energetic, intellectually curious man. SA: Who are your favorite historians in the field of pre-modern Japanese history? Who had the biggest influence on you? CV: Ron Toby and Martin Collcutt are two historians whose work I’ve always admired. Hal Bolitho has written some of the wittiest book reviews of academic works ever, and had a grand style in prose and speech both. Marius Jansen’s sweeping command of the field of Japanese history was awe-inspiring, as was his ability to synthesize scholarship. SA: As an academic in the field, how do you feel about the current state of pre-modern Japanese studies? CV: To be honest, I’m a bit troubled by what seems like an exodus of scholars from Tokugawa to Meiji history. In part I think this is market (read “job”) driven. There aren’t very many scholars left anymore who focus on the Edo period. But, perhaps that will change. You were recently at a pre-modern Japanese history conference in Europe. Can you tell us a little about that? CV: Yes, I was fortunate enough to be invited to a conference on Tokugawa history, organized by Professor Richard Bowring at Cambridge University in England this past March. I was asked to chair a panel on Ritual and Ritual Practice and to comment on the three papers the panelists presented. It was a wonderful opportunity to meet scholars of Tokugawa Japan from all over Europe, not to mention a handful each from the U.S. and Japan. This was the first such large conference—over thirty participants—on Tokugawa history in quite some time. SA: On average, how many of your students per annum express an interest in pursuing a career related to Japanese history academia? What kind of advise do you give these students? CV: Unfortunately my institution does not have a program in Asian studies, so we don’t develop students with the requisite language skills to do graduate work. I have had a handful of students who have transferred, though, in order to pursue further studies in Japanese history and culture. I tell any student who is interested in pursuing a higher degree in Japanese history to develop the best language skills they can as early as possible. I also urge them at a later date in their careers to learn to read brush-written documents; without that ability you are limited in your research to using materials that some other scholar or publisher thought important enough to make available in print. SA: As an educator trying to impart your knowledge and passion about Japanese history on your students, what do you find most rewarding? What’s your biggest frustration? CV: What I find the most rewarding and gratifying is when I discover that students are doing extra work (reading/research) on their own, beyond any class assignments, because they find the material we are studying so fascinating. I think my job is easier now because of the popularity of anime. A lot of my students come to my classes interested in Japan—or what they think is Japan from anime—and want to learn more. In the early 1980s, the mini-series Shogun was big boost to the field, but now I would say it is anime. The first day of class this past semester I asked my students (in my “Japan in the Shogun Age” course) how many of them had heard about or seen “Samurai Champloo” and about 2/3 raised their hands! That surprised me. Frustration? Not having a strong language program or area studies program at my university, which would support and complement what I do at the university. SA: Let’s talk about your research and books. Both Breaking Barriers and Tour of Duty deal with traveling in the Edo period. What drew you to this specific topic? CV: Kaempfer—reading his accounts of people encountered on the road as well as his lengthy description of a daimyo procession caught my attention my very first semester in graduate school. I wrote a paper on alternate attendance for that class, but ended up writing my first book on commoner travel and the development of a road network by the Tokugawa shogunate. In writing Tour of Duty I returned to what first caught my interest long ago. In a sense, these two works are book-ends: the first about the movement of commoners; the second, largely about the movement of bushi. CV: Well, it certainly appealed to the Greek-American DNA that courses through my own body. My grandfather was a big traveler—left his island of Kalymnos, near Turkey, for Argentina and then America. My father made his trans-Atlantic migration to the US at the age of three. We moved around quite a bit growing up, when my father was transferred from parish to parish (he was a Greek Orthodox priest). I’ve lived in a number of foreign countries and traveled to Japan 21 times, at last count. So reading other peoples’ accounts of traveling has always resonated with me. Having trekked over some of the byways that travelers used during the Edo period—along the old Tōkaidō around Hakone and Hata, along a long stretch of the Kisokaidō, and along the Tosa routes to the north and to the east of Kōchi—it’s been easy trying to transport myself mentally back in time, to imagine what the experience must have been like. It is exciting to read a retainer’s account of his first trip outside his home domain, as he sees new things, experiences new customs and hears local stories. SA: Documents from Tosa play a large role in Tour of Duty. What was a determining factor that locked you on to the impact the system of alternate attendance had on this han and retainers of the Yamauchi? Did this have anything to do with the influence of the late Professor Marius Jansen, who was an extensive scholar of Edo-era Tosa? CV: What did it for me was the existence of a wide range of documents in Kōchi that would support the kind of social and cultural study that I wanted to write. Also integral was the openness and kindness of numerous people there who granted me unparalleled access to materials there. I write about this in my acknowledgements, but being allowed access to the family archive of one of the Counselors (karō) of Tosa domain before it opened to the general public and being allowed to work in the basement of the Yamauchi Shrine Archives, surrounded by the Edo-period documents and works of art stored there, are just two examples. The generosity of the people at the Prefectural Library and the friendliness of Kōchi people is something I will never forget. SA: In your opinion, if you had to choose one overwhelmingly interesting inadvertent “byproduct” of the alternate attendance system, what would it be? How did it impact the development of Edo period society and culture? CV: Just one?! Pressed to pick one, I would say that an important “byproduct” was the involvement of retainers in various cultural networks in Edo. Given that official duties were not onerous for most middle and lower-ranking retainers, there was plenty of time for them while in Edo to study with famous teachers and to cultivate skills (from the poetic, artistic to the martial) that would be of benefit back in the domain. The enforced period of residence in Edo in effect raised the cultural level of the country. SA: A lot of your analysis delves into the explaining the symbols of power projection and some of the theatrical aspects that accompanied these displays during daimyo processions. In reality, how important were daimyo processions as a means of power projection once the daimyo left his own borders? Did they really mean something beyond projections of “face and prestige”? CV: Interesting question. There were at least two audiences for daimyo processions: the first, as you point out, was the local, domestic audience, the people of the lord’s domain; the second was for a more general “public,” the people outside the domain, and helped to solidify a daimyo’s place in the political hierarchy of the realm. Very few people, relatively speaking, were able to witness a daimyo procession themselves, but word of mouth and graphic depictions of the processions played a role in establishing the reputation of a domain—i.e. whether its procession was still resplendent, or whether the lord was facing difficult times and had to cut back on the size of his procession. The reputation of a lord or domain was critical in the political world of the times. But the processions had another, very different type of meaning, too. They were important to the local economies—the economies of the post stations and surrounding areas—in both a positive and a negative sense. The processions figuratively spread money along the highways, which benefitted local economies, but at the same time the corvee labor demands required of peasant-farmers who lived in surrounding areas to provide horses and labor power (a subject I write about in my first book, Breaking Barriers) had a negative impact on personal, household, and village economies. SA: When I read Tour of Duty, I was somewhat surprised that there wasn’t much in it about samurai patronage of the pleasure quarters during their assignments in Edo. Are images of samurai from the outer han dallying in Akasaka, Asakusa and Yoshiwara a product of the imagination planted by exaggerated histories, books or movies? SA: Tour of Duty is really a great book. I enjoyed it immensely. Do you have any other projects that you are working on that you can tell us about? CV: Thank you very much. Yes, I am working on a book tentatively entitled Japan as Samurai Nation. As this suggests, it is a study of the samurai as a trope or symbol for Japan, from the Edo period until today. It deals with both the historical reality of the samurai as well as the way that samurai have been perceived, historically, in both Japan and abroad. I’m particularly excited by this project, which will take me into contemporary times and treat issues of national identity. SA: That certainly sounds like an interesting topic. I’m definitely looking forward to reading it as it sounds like you and I share some common interests! In terms of Japanese history, what have you recently been reading? Anything you can recommend? CV: I’m currently reading, and enjoying, Richard Rubinger’s Popular Literacy in Early Modern Japan. SA: How did you find the SA Archives and what drew you to its forum? CV: I don’t recall how I first encountered it, to be honest. It was probably when I was first putting together a syllabus for a new course, “Constructing the Samurai,” and surfing the web to see what was out there. I’ve been impressed by the professional nature of the site, the wide coverage of subjects, the depth of the interviews with scholars and the considerable knowledge of the forum members. I’ve learned a lot from reading some of the threads. As you know, there are too many sites on samurai out there that have little substance; Samurai Archives is a welcome relief! SA: Thank you for the positive feedback as it is much appreciated. However, is there anything you would like to see us try to do with the SA, in order to raise the level of our scholarship or improve the quality of historical discussions? CV: There are probably copyright issues involved, but it would be nice to have full texts of the various daimyo house codes. Another idea might be to have a section devoted to primary source documentation. Again there might be copyright issues involved but in the case of documentation out there already on the web, you could have links to them. One example would be Charles Wigmore’s translations of the Laws for the Military Houses (Buke sho hatto). A bibliography on the samurai would be useful as well, not to mention a convenient list of good web sites related to the samurai. SA: Thank you for the feedback. The rōjū will discuss your ideas with the Shogun. We do have some select bibliographies or resource lists in some of the individual forums, but they are in need of updating. And you are right about house codes and translation copyrights, but we will look into that. Professor Vaporis, thank you very much for taking the time to sit down with us. This has been a real treat and a pleasure. We hope to have you back after your next book. CV: Thank you for the opportunity.